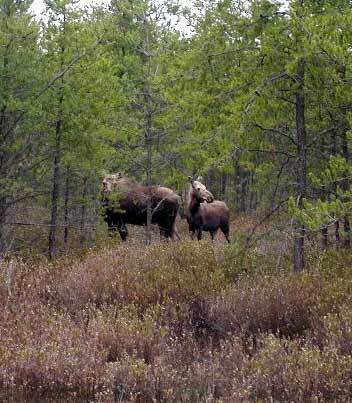 Memorial Day Weekend I spotted these two moose off to the side of the road in Paradise, Michigan located in the Upper Peninsula. They were in a swampy area standing in water, about 40 feet from the road. It was around 2:30 p.m. when I spotted them. I got out of my car and they didn't seem to mind that I was 40 feet from them taking their picture. I did however have my truck right by me in case they charged me!